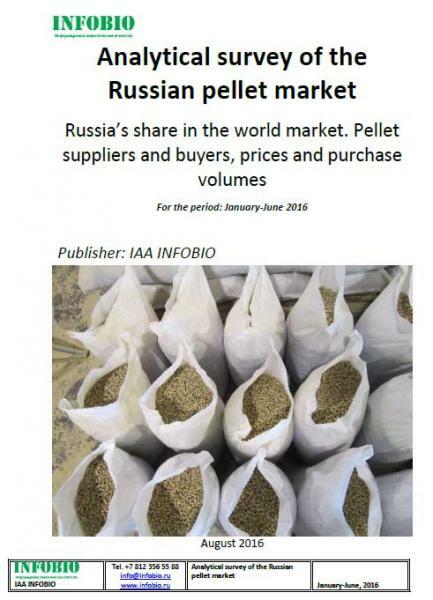 The Russian wood-pellet industry report: prices,volumes, producers and consumers. 2016 | Information and Analytical Agency "Infobio"
The new report about situation on the Russian wood pellet market is published. The full 2016 is available now. 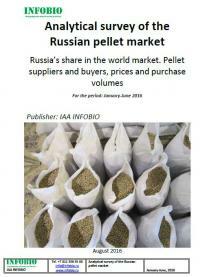 Analytical market survey of the Russian pellet market is a comprehensive analysis of the situation on the Russian pellet market and the country’s position towards the competitors in the world market. The survey consists of several parts and includes marketing information on prices, volumes, competitors, buyers, as well as market trends and changes. The pellet market survey analyzes official statistics of the companies – exporters of pellets, FEACN, official statistics of Eurostat and Rosstat. In certain cases the data of European and Russian institutions does not coincide. This is due to the fact that the European statistical institutions take account of only one FEACN code, while Russian companies export pellets using three different codes. Besides, there are some inaccuracies in statistical records from both sides. The survey provides comments and clarifications in each separate case. The survey data may have discrepancies with internal data of pellet sellers and buyers due to the fact that official reporting of goods happens with a number of assumptions. Some companies declare larger export amounts in order to receive a larger sum of VAT refund. Other companies may provide inaccurate data to the statistical agency. In a number of cases we will indicate, what kind of capacities the company actually has and whether it can export the declared volumes. In general the survey contains dual verification of data, i.e. the Eurostat data is reconciled with statistics of importing countries, Russian customs and statistical data, as well as with data of consulting agencies in EU, USA, Canada and other countries. The survey has been arranged by the countries of export of pellets from Russia. Besides the information about buyers and sellers of the commodity, the survey gives a description of domestic markets of each country. The survey makes a special focus on the price policy and prices at different Incoterms conditions. The summary of the survey contains information about a number of companies, as well as most important pellet market news that happened during the period analyzed by the survey. Traditionally the leading countries that buy wood pellets in Russia are Danemark and Sweden. Southern Korea takes the third place in the rating of importers of Russian pellets due to the active efforts of “Arkaim” JV. Italy and Finland open the second group of courtries – importers of Russian pellets – and take the 4th and the 5th places in the import rating. Followed by Germany, Latvia and Norway. Estonia and Lithuania close the group of leading buyers of Russian pellets. Other countries – Hungary, Poland, Czech Republic, USA, Austria, Belgium and other have purchased in Russia less than 2 thousan tons of pellets within January-June, 2016. Price for the English report is 1500 Euros.